I collect Novelty Lamps as a hobby. They amuse me and are a joy to look at. It also makes my room unique as no-one else has a collection quite like it. 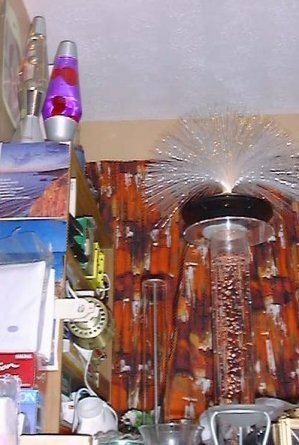 The lamps include the two lava lamps on top of the bookshelf, the projector just showing at the bottom, the plasma tube in the middle and the bubble tube on the right. Click on each lamp to view.